This game is completely unfinished, very buggy, and confusing. So I created this in order to help you with your journey, if you want to play. The top bar contains GOLD, ATTACKING POWER, and FOOD. TAKE POWER = REMOVE 1 DEFENSE POWER, and give 1 ATTACKING POWER. When you click on neutral territory (shown by the color grey), there is a single option. When you click on enemy territory (shown by other colors that isn't red), there is a single option. on the top left corner, and top right corner. To begind combat, you must choose between the three options. SWORD, SHIELD, or BOW. 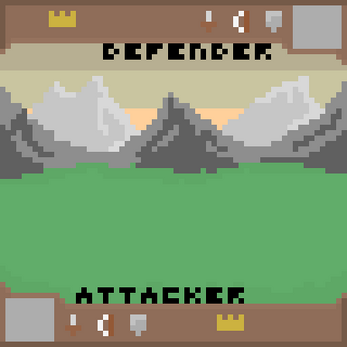 The options act like "Rock-paper-scissors"
After the +3 POWER Bonus has been added, the Defender's DEFENSE POWER will be added. The person with the most attack/defense power is the winner. REPEAT TILL YOU WIN, OR QUIT THE GAME! Sorry for the shotty page. Rushed it.